“For all my family. For all my friends. Including you.” So goes the most heart-warming dedication to a poetry collection you’re likely to read this year. In his latest book, Flipstones, St Johnstone’s poet-in-residence Jim Mackintosh has caught the imaginations of so many, not only through the dazzling array of subjects on display in his poetry, but also the deeply humane and thought-provoking nature of his writing. Flipstones is a joy to read and a credit to ground-breaking publisher, Tippermuir books, who have proven themselves a credit to Scottish literature time and time again with releases such as Matthew Mackie’s much-loved Scots translation, “The Tale of the Wee Mowdie” and Anthony Camilleri’s affectionate and moving memoir “Hunters Wee Stories from the Crescent”. 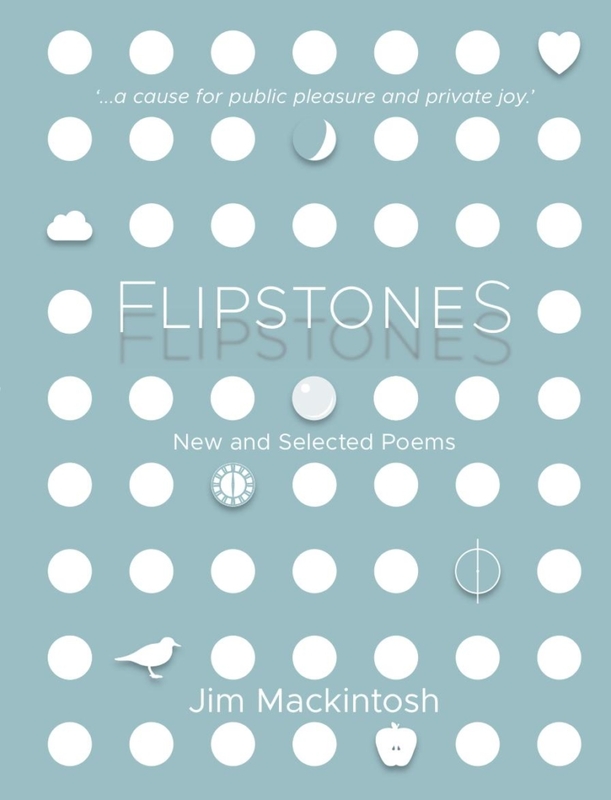 Jim is the working definition of a people’s poet, and reading Flipstones is like taking a stroll on a warm summer’s day with a friend whose thoughts delight. With his eagle’s eye for detail, deep curiosity about the inner lives of his subjects, and startling talent for original imagery, to take a stroll with Jim through the landscape of this collection is to remember with dazzling clarity what life is really about. But his talents only begin with description. Jim is also the poet as advisor, as a spokesperson, as a chronicler of our times. There are a myriad of themes in this versatile collection, but the one which most resonates is Jim’s innovative approach to the concept of time. The fluidity and ease with which he shifts from one age and viewpoint to another is remarkable, and he does so while remaining wonderfully free of cliché. Other poems which draw richly from the past are more personal than political, though Jim never seems to write with either theme exclusively in mind. While Jim recognises that he “lacked the collarless shirt and pipe to finish the transition”, this simple description of a man now gone, once fully consumed by this simple act of leisure, makes for a touching piece of poetry, in which boy and man (and the man the boy later became) are conjured up all at once, simply and beautifully. Again and again in Jim’s poems, nature acts as a portal to the past, its tactile, living presence a constant reminder of the timeless nature of the human experience. Through making explicit nature’s ability to summon up men and women long dead, Jim reminds us not only of our own mortality, but our responsibility to preserve the planet for future generations. Here is a poet who writes with the past, and the future, firmly in mind. That such an intricate poem should spring from this association may seem natural, but it is Jim’s poetic craft which is at work. Few poets are able to keep a grasp on so many facets of life all at once while maintaining such strong imagery. This is a gift which Jim has honed to an art form, offering us a kaleidoscope of images from disparate lands and lives, all intertwined – shifting, interlinking, dazzling, speaking straight to the heart. By the time the poem ends, we have become so grounded by the almost uncanny backdrop of this once idyllic landscape, that the image of these ghostly soldiers, searching “For the wind heaved spot where they’d planned / The routes of unhurried journeys never to be taken” is too much to bear. Despite the often challenging subjects of his poetry, it is impossible not to stand and stare at the landscapes Jim walks us through so thoughtfully, so expertly. He has perfected the incredibly difficult art of conjuring up a scene so rich with life and history that it feels as though you are recalling your own experience as you read his poems. How lucky we are that Jim has decided to invite us along with him on this marvellous journey. Follow him, not as a fan, but as a friend, with joy in your heart. You won’t regret a single step. Thanks for this, I’ll definitely look out for this one. Tippermuir also published an Ajay Close novel I can recommend called ‘Trust’. Thanks for your comment, Peter – will add ‘Trust’ to my reading list! I agree entirely with this superb review. I love my copy of Flipstones and already it’s becoming a well-thumbed favourite.